Just Who the Heck is Rex Whitton? I like research. I think it’s fun to ferret out information, and often learn fascinating new facts in the process. Someone just has to say “I’ve always wanted to know . . .” or “I’ve always wondered . . .” to make me itch to find out. Rex Whitton is a Missouri boy done good. 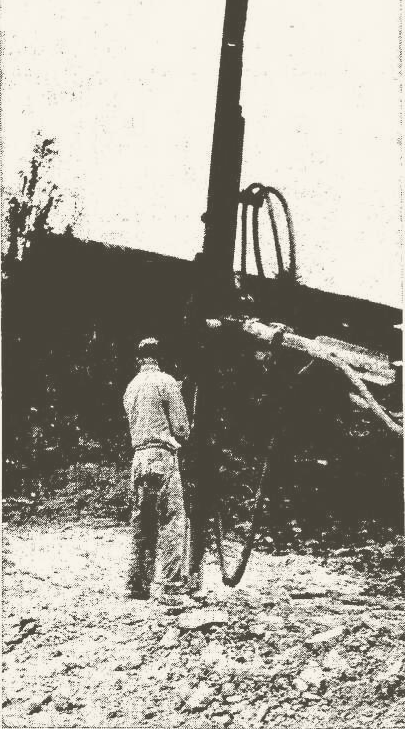 Born in Jackson County and educated at the University of Missouri, Whitton worked for the Missouri Highway Department for more than forty years beginning in 1920, working his way up from levelman to chief engineer. The Highway 50 Expressway project through Jefferson City was planned and engineered while he served as chief engineer. In 1955, Whitton became president of the American Association of State Highway Officers. In that capacity, he lobbied for creation of the Federal Interstate Highway System. On June 29, 1956, President Dwight D. Eisenhower signed the Federal-Aid Highway Act of 1956. Under Whitton’s leadership, Missouri became the first state to award a contract using the new interstate construction funding for work on US Route 66 (now I-44) in Laclede County. In January 1961, Whitton was appointed as Federal Transportation Administrator, and on August 18 of that year, the $7.6 million Highway 50 Expressway project through Jefferson City was dedicated. A 100-car motorcade delivered state and local dignitaries to the stretch between Madison and Monroe Streets, where Jefferson City Mayor Forrest C. Whaley presented Whitton with a city resolution naming the expressway in his honor, and local restauranteur John Adcock bestowed Whitton with the grand champion Cole County ham. Although the expressway was not part of the interstate highway system, Whitton seized the opportunity to explain that the interstate and defense highway system was designed to meet the traffic needs of 1975. Furthermore, under the recently enacted Federal-Aid Highway Act of 1961 (Whitton received one of the pens President Kennedy used to sign it into law), all 41,000 miles of the interstate system would be open to the traveling public by 1972. Congestion—along with funding and safety—was one of the key issues that Whitton addressed during his six-year tenure as Federal Transportation Administrator. Whitton spent his retirement years farming and consulting in the Kansas City area, where he died in 1981. That’s the main story. Sure enough, I also dug up some fascinating facts along the way. For example, did you know that our expressway utilized the first radar-controlled traffic signals in Missouri? Another benefit of this research project is that I learned how to use the microfiche reader at the Missouri River Regional Library. The reference librarian handed me the correct reel, instructed me on the use of the reader, and turned me loose. Once I got used to the dizzying sensation of seeing the pages fly by on the screen, I relaxed and enjoyed the ride. Any resemblance between these drills and those used by the dentist are purely coincidental. The sizes are different. These drills are used for boring holes for dynamite, for solid rock excavation, not for piercing dentine. Such excavations were necessary during the construction of the new Jefferson City expressway. And I admit to getting a chuckle from the champion Cole County ham. Though at the time I’m sure it was given solely as a token of appreciation, half a century later I see some irony in presenting a highway project administrator a gift of pork. I am thrilled to announced that my latest Arch Book story is now available from Concordia Publishing House. I have been an Arch Book fan since I was a little girl. I remember having them read to me at bedtime and receiving them as Christmas and Easter gifts. My favorite was a retelling of the Parable of the Talents, Eight Bags of Gold (now out of print). Now, as an adult, I welcome the opportunity to give a child the gift of a Christian storybook for less than the cost of some greeting cards. As a Christian, I appreciate that every story is Biblically sound. As an author, I am thrilled to be published and grateful for the opportunity to do the kind of writing I love. I am often asked how I got into writing Arch Books. One day when I picked Laura up from kindergarten, I took her and Joseph to Hanna’s eighth grade book fair. I mentioned to the kindergarten teacher that I loved Arch Books and had always wanted to write one. She told me that a friend of hers had gotten published after attending a writing workshop. The next day she sent information about the 2002 Writing for the Church Workshop home in Laura’s backback. I signed up right away. The workshop took place at Concordia Seminary in July. I was fortunate to live just a two-hour drive away, but other participants flew in from all over the country. One of the first things our facilitators, Resolute Rod and Electrifying Earl, asked of us was to introduce ourselves with a descriptive alliterative adjective. Unfortunately, Sassy Cindy took mine before I had a turn. There were only a few participants sitting between us, so I didn’t have much time to come up with a new one. I briefly considered Sweaty Sara, inspired by the sweltering St. Louis summer heat, but settled on Splendid Sara. For someone like me, who is terrible with names, this exercise was wildly successful. I can still remember many of my colleagues’ nicknames: Chortling Charles, Ornery Arlene, Jovial Jonathan, Jazzy Jane, Fun Phil, Candid Karen, Zealous Zeal. The workshop was intense. Besides refreshers on writing styles, we learned specifics about writing for the Lutheran Church Missouri Synod. Many of the workshops dealt with writing for the devotionals Portals of Prayer and My Devotions and the preschool magazine Happy Times, all publications that were actively recruiting writers. I anxiously awaited a visit from the family editor later in the week and worked on a draft rhyming story about Ruth from the viewpoint of Boaz. When the family editor finally arrived for her session, she focused mainly on devotionals with just a few comments concerning Arch Books. Arch Books have evolved over the years and now have a consistent 16-page, 64-line format. Every book, even the Old Testament stories, must contain a Gospel message. All stories must be scripturally sound and feature no whimsical characters or talking animals (which explained why Donkey Daniel in Bethlehem is out of print). I asked more about Arch Books during a personal interview. I learned that CPH publishes just four Arch Books each year – one Old Testament story, one New Testament story, one Christmas and one Easter story. CPH already had a stable of Arch book authors, so unlike the periodicals, they were not recruiting. She enjoyed my draft of Kind Farmer Boaz, but encouraged me to pursue other opportunities. Disappointed, I spent the rest of the workshop working on a manuscript for Happy Times. By the time the conference ended, Sassy Cindy and I had a joint contract for the next year’s December issue. But once home, I couldn’t stop thinking about Arch Books. Every time I sat down to try to write something else, “Old Testament, New Testament, Christmas, Easter” kept running through my mind, nearly becoming a mantra. After a while, I recognized it as a nudge from the Holy Spirit and developed four stories. For an Old Testament story I wrote God Said, “It Is Good,” based on the story of creation. A New Testament story, Which Son Did Right?, was based on the parable of the two sons and the vineyard in Matthew 21:28-32. The Christmas story I wrote was Anna Tells God’s Promise, about Jesus’ presentation at the temple from the point of view of Anna the prophetess. Finally, Mary Magdalene’s Easter Story was based on the account of Mary Magdalene’s visit to the empty tomb in John 20:10-18. The entire process took about exactly a year after attending the conference. While I did not anticipate publication, I felt a sense of peace, relief and accomplishment when I mailed the packet. Just a few months later, I had a voice mail from the CPH family editor. Mary Magdalene’s Easter Story had been selected as the Easter Arch Book for 2005! The timing of my submission had been perfect. Dan Brown’s The Da Vinci Code was on the best sellers list and CPH had never published an Arch story about Mary Magdalene. And that is the story of how I became an Arch Book author. Looking back, I can see God working to my benefit in so many ways, and I am truly grateful and humbled. I discovered three internet sites last week that tickled me pink. As I am feeling particularly generous, I’m going to share them. 3. 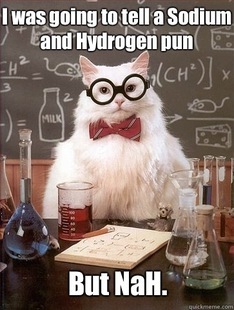 Chemistry Cat – Three of my favorite things – cats, science and puns – rolled into one. I Zn these are hysterical. 1. Seussville – This should be pronounced “Zoice-ville,” by the way. Random House has created a truly Seuss-inspired funhouse of activities. Visit your favorite book, learn about whimsical characters, discover little known facts about one of America’s most beloved children’s authors. Oh, and design your own Who! Five years ago, on June 2, 2008, I underwent brain surgery: microvascular decompression of the seventh cranial nerve in an attempt to cure hemifacial spasm. Unfortunately my facial nerve was damaged during surgery and I awoke with left side facial paralysis; I could neither smile nor blink, and my eye no longer produced tears. In addition to the trauma of losing my pretty smile, I experienced extreme pain from dry eye. Over time the nerve healed. I have recovered quite a bit of facial function. My smile is not what it used to be, but most people don’t notice that anything is wrong. I’ve learned how to make a smaller smile to minimize the difference between sides. I now produce tears when I cry or eat spicy food, but not under normal circumstances. I have tried every type of eye drop and gel I could find, but Refresh PM ointment is the only one that keeps dry eye pain at bay. My brain learned to compensate for the blurry vision on the left side, but over time it became mentally exhausting. This is the story of my nearly lifelong quest for sharp vision. It’s long and a bit on the clinical side now and then, but I feel it is important to be as thorough as possible in case it can help someone else out there. I grew up nearsighted. In third grade I failed the school vision screening and made my first visit to an ophthalmologist. I remember leaving the optical shop after getting my first pair of glasses and marveling at seeing individual leaves on the trees. I was 8 years old. Thus began a progression of horrible nerdy glasses, the early ones complete with real glass lenses. Every year my vision got progressively worse and the lenses thicker. I disliked wearing eyeglasses, but couldn’t see without them. OK, they were never that bad. Or maybe they were. I am having trouble finding my grade school pictures, but when I do I will post one. Or not. Those despised spectacles did provide some dramatic moments. Once during a bombardment game in elementary school PE, I got hit in the face with a beanbag. My glasses flew across the gym and the glass lenses shattered. I was blind for a week waiting for a new pair. In high school I was invited on a horseback ride. During the home stretch across a hayfield, the horses began to gallop and my glasses – new of course – flew off my face. The next day my friend’s father, a career military man, organized a search line. Miraculously we found the glasses. 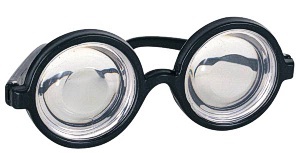 Fortunately for me, lens technology had progressed to thinner and lighter plastic with scratch resistant coating. My senior year in high school, a miracle occurred. I had my annual appointment with the ophthalmologist, anticipating yet another pair of geeky specs. To my amazement, my mom and dad had decided to surprise me with contact lenses. I was fitted with soft contacts and was at long last able to forgo the coke bottle glasses. I could see better and looked better. Win-win. By the time my three children had been born, my prescription was -7.5 on the left and -9.0 on the right. A twilight driving scene as it appears to a person with normal vision, left, and to a severely nearsighted person like me, right. Weary of glasses, contacts, and solutions, I also hated not being able to see my kids at the swimming pool. I had been monitoring the development of laser surgery, and it had finally progressed to the point where I felt comfortable asking my ophthalmologist about it. In February of 2000 I had LASIK performed in Kansas City. My refractive surgeon was reputed to be one of the top three in the country. He gave me ten units of correction on the right eye (at that time, the most that he would do) and eight on the left. I had been warned that my level of correction would probably require an enhancement surgery a few months later, but I was fortunate not to need it. My eyes healed perfectly. (I do see halos and starbursts around light sources, but I had that before surgery due to extreme nearsightedness and large pupils, so it causes me no distress.) After some mild post-surgical dry eye that resolved after a few months, I never looked back. How LASIK works. Take note of the change to the curve of the cornea after surgery. That will be important later in my story. For eight years, I was able to take my vision for granted. Then came the microvascular decompression surgery and severe left side dry eye. I do not know how I was able to tolerate the plane ride home, but I made it somehow. After a few weeks of trial and error, I settled into a routine of applying Refresh PM ointment around the clock to keep my cornea moist. It gave me relief from dry eye pain, but also blurred my vision. In August I had a 1.8 gram platinum weight implanted into my eyelid to aid in closure. It helps to keep my eye shut at night, but unfortunately does not provide a complete blink. In September 2008 I first asked my ophthalmic surgeon about the advances in scleral lenses being made by the Boston Foundation for Sight. Instead of resting on the cornea, the edges of these lenses extend to the sclera, or white of the eye, creating a moisture chamber on the surface of the eye, relieving dry eye pain while providing clear vision. The surgeon dissuaded me, stating that the lens was only indicated for debilitating facial injuries such as Gulf War soldiers who had lost their eyelids altogether and had no protection for their eyes. I resigned myself to a lifetime of accepting less than optimal eyesight in exchange for keeping my cornea healthy and pain free. But it seemed to me that a scleral lens would be ideal for a situation such as mine, so a little more than a year ago, I brought the subject up again. I think the doctor realized I would not be giving up the idea, and reluctantly granted permission to find and consult with a specialist in contacts for dry eye. He warned me that my eye might be too sensitive to be fitted successfully. Extenuating circumstances kept me from pursuing it right away, but a few months ago I began to see an increasing number of posts on the Acoustic Neuroma Eye Issues Forum concerning scleral lenses. I live in a small city, so I was not surprised to find that my local ophthalmologist does not fit scleral lenses. I contacted the manufacturer of one of the lenses mentioned on the forum and received a referral to an optometrist in a nearby city. I emailed a brief history to the doctor and received a reply that he believed he could help me. At my initial appointment he recommended that I try Restasis twice a day for a couple of months to see if it would give me relief without needing a lens. He also recommended eyeglasses because the vision in my right eye had degraded slightly, to -1.0. Unfortunately, I did not do well at all with Restasis. Both of my eyes burned whenever I applied it, and I could hardly stand to wait for the required fifteen minutes to pass before I could apply drops or ointment. I did some research and discovered that Restasis was not effective for dry eye due to nerve damage and contacted the doctor to ask to discontinue the Restasis and proceed with a scleral lens fitting. The first lens turned out to fit too loosely even though it looked perfect from the fitting kit. I brought it home so that I could practice inserting and removing the lens. I could only wear it an hour at a time because the lubricating drops slowly leaked out of the bottom of the lens making the lens uncomfortable and blurring my vision. I am currently testing a second lens with a tighter fit. If my eye doctor was 10% satisfied with the last lens, he is 80% satisfied with this one. We will decide at my appointment next week whether to tighten the fit a bit more as it still settles just under center. I can wear it for increasing lengths of time, starting with 3 hour increments and increasing by an hour every day. On the right side, we tried several regular soft lenses, but my cornea is so flat post-LASIK (remember the diagram above?) that the lens slides and does not hold its shape. I can’t afford a second scleral lens at this time, so my doctor has recommended a custom soft lens to take into account my flat cornea and large pupil size. I’ll be able to try that next appointment also. Update (07/15/13): The name of the custom soft lens I tried is SpecialEyes. I have also seen one called RevitalEyes. There are likely others as well; if you are interested I suggest googling for “custom soft contact lenses” or “post-LASIK soft contact lenses.” I did not keep the lens. As it turns out, the -1 in my right eye with the corrected vision from the left scleral gives me more-or-less textbook monovision. The increase in distance vision from the right lens was not enough to compensate for the loss in near vision. Although I did not reach my goal of crystal clear vision for my fifth post-MVD anniversary, I am close enough at this point to celebrate. I am happy to report that – severe myopic, post-LASIK and post-MVD – there is light at the end of my tunnel. Here is a list of scleral lenses I have been able to identify. Let me know if I have missed any, and I will add them. Some unusual cases and harder-to-fit eyes may require custom scleral lenses. Instead of starting with ready-made fitting kits, these lenses are custom designed for each eye. The fitting process requires approximately a week of travel to their location. BostonSight PROSE – custom scleral lenses by the Boston Foundation for Sight. US providers are located in Needham, MA, Los Angeles and San Francisco, CA, San Antonio and Houston, TX, Chicago, IL, Ann Arbor, MI, Miami, FL, Baltimore, MD, and Great Neck and New York, NY. Overseas in India and Japan. Global Refractive Solutions Laserfit – custom designed lenses using high resolution digital imaging. The design process was developed and patented by Dr. Greg Gemoules of Coppell, TX (Dallas area). Lenses are manufactured to his specifications by TruForm. EyePrintPro – Custom prosthetic scleral cover shells made using a direct impression of the surface of the eye. The developer of the scleral shell practices in Iowa City, IA. According to the website there are additional practitioners across the country, but I was unable to find a list on the website, though there is a contact form for questions or comments.